I’m just home from an incredible 3-day city break in Amsterdam and I couldn’t be more upset about it. The minute we arrived in our hotel to leaving for the airport to fly home it was crazy busy but brilliant! 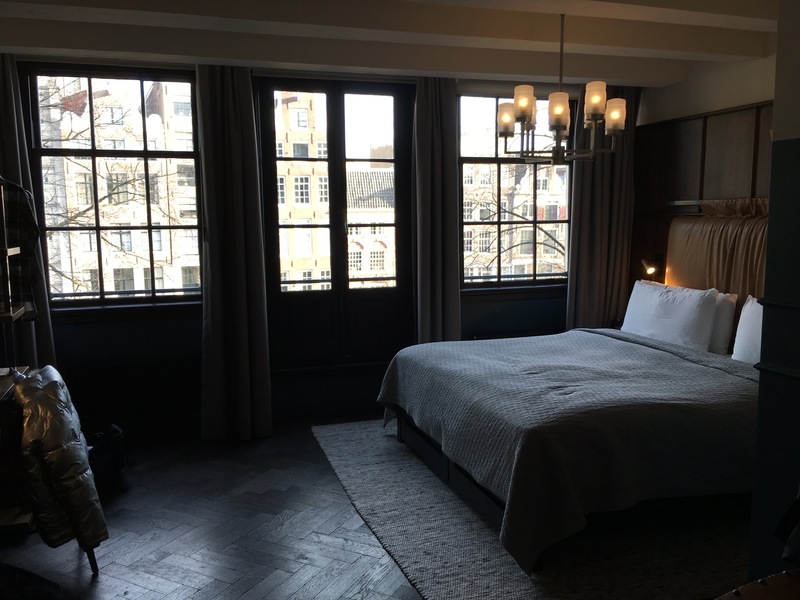 We stayed in a gorgeous hotel, The Hoxton, in an area called 9 streets. The hotel came highly recommended to us by a friend and it did not disappoint! We had an amazing room with a view out on to the canal so we couldn’t have asked for more. However, I was apprehensive about having a weekend away from my normal routine, with the start of my marathon training cycle due to begin in just a weeks time. With no room in my hand luggage for my runners, I set about researching some healthy eateries to ensure that I at least stayed relatively on track with my nutrition. Upon arriving in Amsterdam, I quickly realised that it wasn’t going to be hard to eat well there. Being a pretty hip city, it was way ahead of the game in terms of health cafes and restaurants. This being said, I was also there to enjoy myself just before my training began so I didn’t want to be too strict with it. On Friday, we were pretty hungry after travelling and arrived at our hotel just in time for lunch. We decided to dine at the hotels restaurant and use the time to get our bearings and figure out a plan of action for the coming days. The restaurant, Lotti’s, had quite a short menu but also offered good options for breakfast, lunch and dinner all within the one menu. I quite fancied a steak (one of my go-to choices when eating out as you can easily keep it relatively low-calorie by pairing with a salad or veg) but as it was lunchtime I opted for a salad instead. Chicken Caesar salad. Now this dish is a tricky one as once you add up the sauce, the Parmesan cheese and croutons, your lettuce based dish could end up clocking in at 1000+ calories. I’m a little fussy when it comes to ordering this. I always ask for dressing on the side – that way I can add the bare minimum or none at all. I also tend to request no croutons as I don’t really see the sense in ordering a salad if you’re going to eat half a loaf of crispy bread through it. However, in certain situations, I sometimes feel uncomfortable or feel it is not appropriate to be making such demands so I just leave them to the side. This time, Lotti’s were super accommodating and I got my dressing on the side! The salad itself; I’d give it a 6/10. Friday night was a little bit of a disaster. We walked for miles across the city before we came to the restaurant where we eventually dined. We just hadn’t planned things properly and by the time we arrived and got a table it was well after 9pm and we were starving from the days exertions. We ate at an Argentinian restaurant in Jordaan called Salmuera. On walking through the door to our table we walked past a huge grill full of chicken, steak, pork and fish with the spicy aromas filling the air immediately…mmm!! At this point I knew we’d made a good choice and I was going to be able to eat well there. We both went for a 1/2 grilled chicken and shared a side of mixed vegetables and sweet potato. 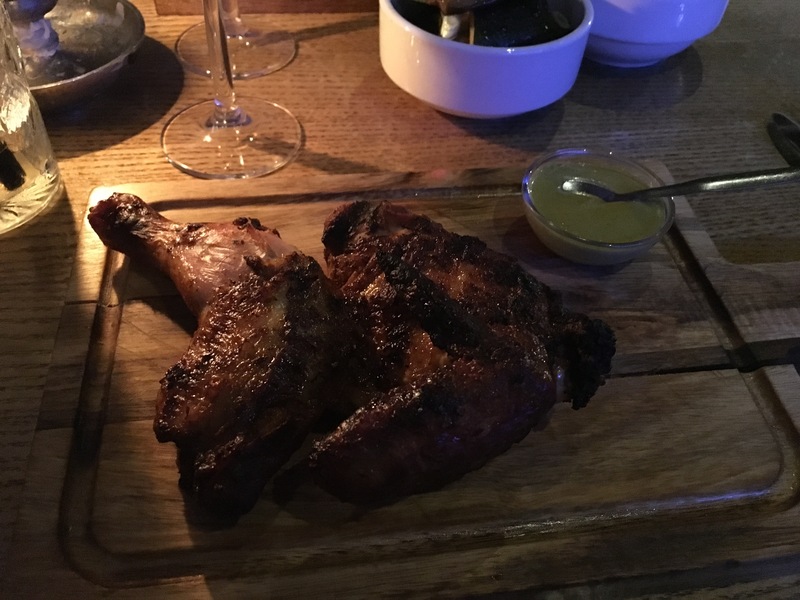 It was a high class Nandos – and that’s not a bad thing! 8/10. I forgot to mention we drank quite a lot of red wine in the Argentinian place so I woke up on the Saturday morning feeling less than fresh – but still determined to stick to my plan of eating as well as possible. That went out the window when we ventured to The Pancake Bakery! It seemed like half of Amsterdam had the same idea.. but it’s always a good sign when you have to wait for a table. After Brandon convincing me I deserved it after all the walking we’d done (and it didn’t take a lot of convincing) I ordered a crepe style pancake with Nutella. It was everything that dreams are made of. I’m sure you can all imagine… but it beat me, I ended up feeling sick and couldn’t finish it. 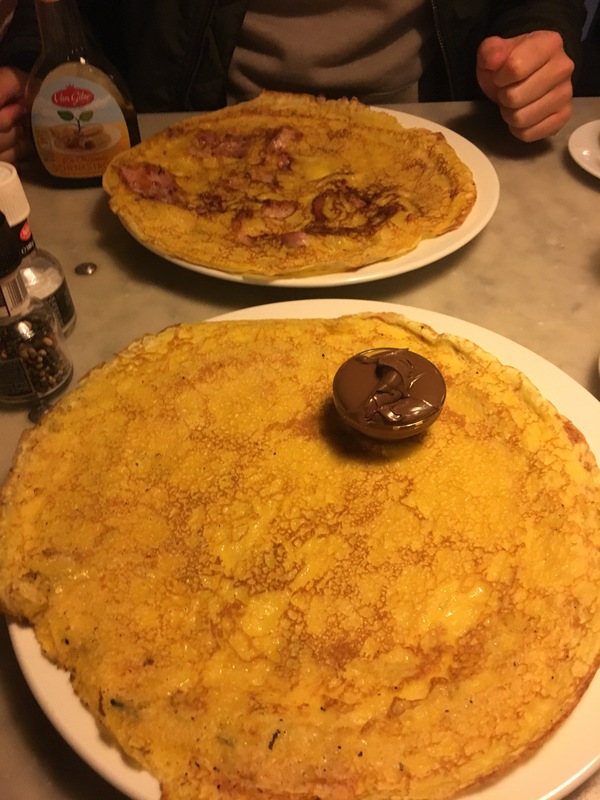 At that point I realised I’d made an error and should have gone for one of their savoury giant omelettes – which looked incredible! It still gets a solid 7/10 but be prepared for the laidback service! Lunch on Saturday was on the go! We ended up getting a Braatwurst from a stall, Braat! on the rooftop terrace of the Heineken Experience. This was a solid 10/10. It was far from what I’d choose as a healthy lunch option back home but it tasted amazing and I really wanted to try it – so I decided not to deny myself a simple pleasure. It was Italian (one of my favourite cuisines EVER!) on Saturday night at Casa Di David. It was just a short walk from our hotel which was also a bonus! We’d tried to get in on the Friday evening but they were fully booked – a good sign – so we had to wait! Make a reservation if you want to go at the weekend. I had Amatriciana bucatini (a kind of thick spaghetti-like pasta) and it was delicious. The carbs were most-welcomed after a long day of walking all over the ENTIRE city! I wish I’d worn my Fitbit to track how many miles we walked/steps we’d done. Pancakes were on the menu again for Sunday morning. This time, we dined at a really cool restaurant, Mook, which was quite a walk from our hotel – but oh, so worth it! The simple, clean interior oozed style and it was clear we were in one of Amsterdam’s hip, well established brunch locations. Surrounded by loads of cool and quirky people, we couldn’t wait to get a look at the menu! 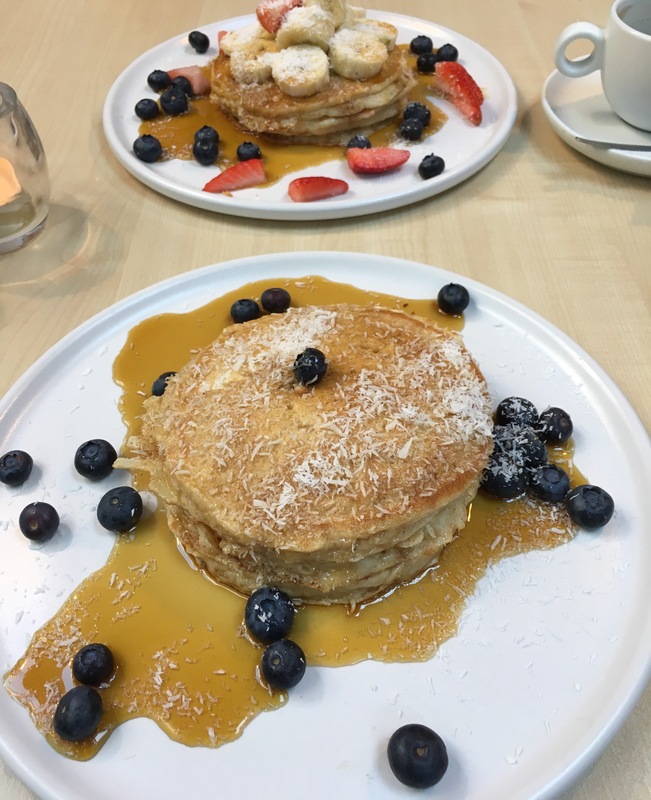 Brandon was excited to see stacks of pancakes being served around us and we both opted for the Blue Magic Pancakes – organic pancakes served with blueberries, maple syrup and coconut. Brandon chose the deluxe version which included strawberries and banana too! They were absolutely delicious but again, I couldn’t finish them! It felt naughty but healthy at the same time! I highly rate this restaurant and would 100% return if I’m ever back in the city. 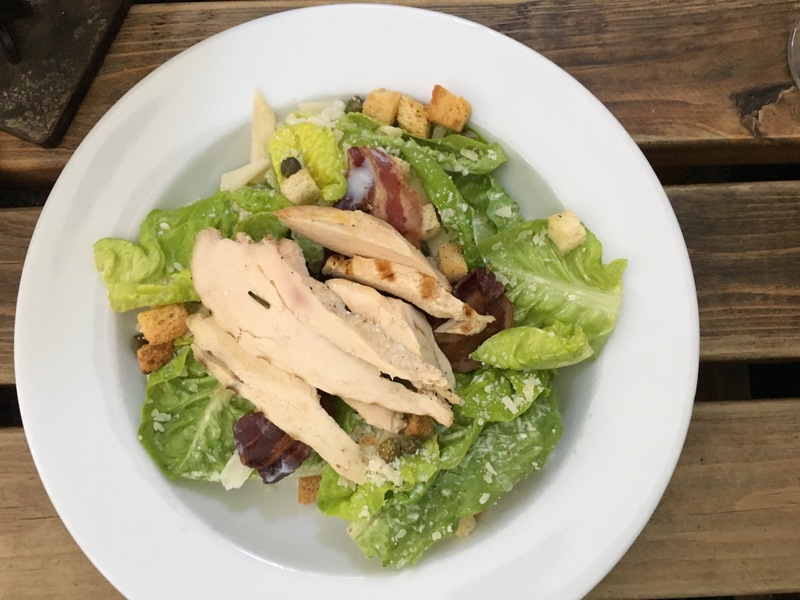 I realised I am a creature of habit when I ended up ordering another Caesar salad for lunch at a gorgeous restaurant we discovered, Herengracht, located in the Herengracht area. Either that or it’s just a popular salad that a lot of restaurants have on their menu. We dined outside in their terraced garden area with Brandon’s friends despite the sub-zero temperatures. That might be a bit of an exaggeration but it was close! I made my usual requests and to my surprise the waitress got it right without writing anything down. My salad arrived and it was delicious; a definite 9/10. Maybe it was the addition of the bacon but I wasn’t even jealous watching the boys eat club sandwiches and french onion soup! Sadly, after all that our weekend in Amsterdam came to and end and it was off to the airport to catch our flight home! There was so much we didn’t see or do and I would love to return to experience it again and check out more of the places we discovered to eat! I hope this is of some use to you all if you ever find yourselves in the Netherlands wondering where to eat out!